Heart is dissected in two parts and bigger than natural size and also shows the thickened ventricle walls and cardiac valves. 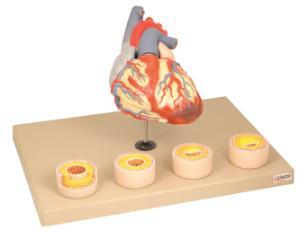 Four individual blood vessel model show progression of atherosclerosis. This model illustrates coronary artery disease / atherosclerosis and progression in the blood vessel, myocardial infarction and damage, blocked artery and left ventricular hypertrophy.